Internally, the architect experiments with different room plans; those on the main axis and on the three cross-axes being symmetrical on either side. The four, main (and unlabelled) compartments have centralised plans of increasing complexity. 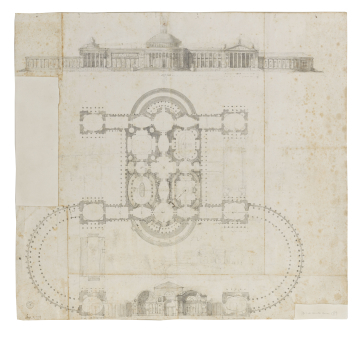 Though the drawing is dated 19 August 1778, by which time Soane (having left England on 18 March) had been abroad for five months, the drawing is in George Dance's hand with only the dimensions in Soane's hand. The drawing technique of, say, the elevation is certainly Dance's - the minutely drawn equestrian statues either side of the entrance support the attribution. The drawing paper with its unreadable watermark appears to be Italian - which is puzzling since logically Dance would have made the drawing in London and he generally used Whatman or imported Dutch drawing paper. Since sealing wax was sometimes used to affix drawings to the drawing board, it's presence does not necessarily imply that the drawing sheet was sent in the post. 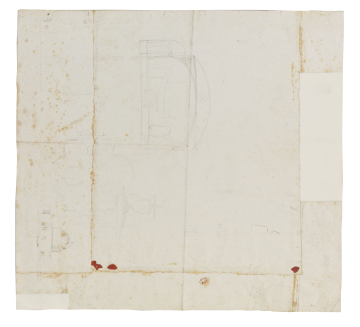 But could it have been a wrapper for drawings sent by Soane for Dance's comments which was then used by Dance to draw on?